So I have not written much about my Tuesday nigh class. Partially because I don’t want to offend the teacher who knows this blog exists and partially because nothing really happens in class. That is technically the issue, the nothing happens part. The teacher (who does not want to be the authority or teacher in the room) is of the opinion that we need to be self directed but at the same time he seems to want to pontificate on his ideas of something for long stretches of time. We have had readings that we never discuss, there was a plan at one point to dig into the ‘big ideas’ and that is a concept I can get behind but after 3 classes we basically were rehashing the same general things with no forward momentum. Last week he said we should each do a position paper on a big ‘why’ question – the topic (in typical vague format) could be on anything…. annoying but something I figured I could work with. Over the past week I thought up a few topics that would fit the criteria of a good discussion for the class; I wanted something that the 6 of us could have a good opinion on without alot of reading, some diverse opinions, a topic that could fit into the time frame reasonably, something that could be useful to us at work… and… I had a greater point of wanting to show the teacher that we all do not think like him. I choose the topic of motivation and asked ‘what motivates you’ in an e-mail to the group on Sunday. This should be something one can speak on fairly easily given a little time parking in your head, and, since I expected we would be all a bit different in motivation some built in difference and learning options should come up. I really had to lead the class, calling on one person and then drilling down into his answer with a few ‘why’ questions then moving to the next. I got around the room, including the teacher, and then asked one person to motivate another based on what he heard. The guy was a good sport and tried but his motivation was more what he would want and not what would really do something for the other guy. I purposefully paired two different types just to show the contrast and I think that was really obvious once we heard it and then we talked a little bit about it. I was pretty lucky to have all 4 types (in my opinion, I could be off since this was very basic), I was not expecting that. I originally intended on doing more pairings but the point was made and enough is enough so I tried the summary tactic of saying what I heard and asking how that can be used in each of our jobs. Good discussion on that too and I really think it was a well rounded class. I cheated a tiny bit with this one because this is all based on my relatively elementary knowledge of the TRI-16 types method, based on the Myers Briggs research but more evolved, where the point is to try to detail how there are 4 different primary personality styles and how they each see the world, what they need to be happy and what makes them stressed (as a very simple overview). Just a basic basic knowledge is eye opening even if you only learn the single fact that there are people very different then you in the world motivated and needing and stressed by different things. One of the cool things about different personalities and motivation it that the same exact end goal can be from motivated from very different roots in different people, looking at why you feel something compared to someone else gives a neat picture. I suppose a mother with a psychology masters and a grandmother who has a PhD in anthropology and is teaching sociology didn’t hurt my ability to lead the class in the direction I wanted it to go… you don’t grow up with this stuff and learn nothing. Anyway, it went well, I even think the teacher learned something. It is a good smart group and I’m glad they were open to my usurping leadership. I think we were close to mutiny anyway… I didn’t teach the class, I listened and asked questions, and on break a few people told me they were really happy we were talking and learning. Hopefully the teacher forgives me, he is very stuck in his personal style and personally now that I know that, his ‘sins’ of the past weeks are more reasonable. I don’t see him as shirking his responsibility as much anymore, but, he was treating us like we were just like him and maybe he sees that. if not, I’ll be prepared next week too to facilitate and keep us from going down the same rehashed paths. Lars says I should go be an adjunct teacher, it would be fun but I don’t believe they let you teach classes when you only have a BA and 3/4ths of an MBA. Maybe some year I will look into it, it would be fun and hey, I’m already building a lesson plan. Today topped off the week with a 6h drive for a 3h meeting but it was a really good meeting. I’m not looking in my work e-mail until some other time but I know I can’t just leave it all for Monday. This week was full of meetings and two supplier visits but I got slightly more done then I thought I might but I’m ready for a weekend. This weekend we are experimenting with Niamh playing at a friends house while Lars and I go see Avitar. We may be the last people (who want to see it) in the universe to go but hey, we have a little kid. Since she is going to be with her BF Jeremy and his parents who she knows pretty well we are hopeful it will be ok. If not, we have phones they can call and they are probably pretty immune to a toddler tantrum and will survive until we can get back to rescue them. Their little guy is way more laid back then our high strung princess when it comes to people but Niamh is getting better all the time – there are whole 15m periods that i’m in the room that she does not feel compelled to be on top of me in some way. That reminds me… teething again/still and we ‘gave up’ one night and let her sleep with us. Renewing our conviction that she needs to sleep in her own bed. Not only did she hardly sleep but she wanted to sleep on top of me and unfortunately for her I’m kinda bony. She could not get comfortable with her head on my shoulder, neck, collar bone, face, arm and while the belly is semi soft it is very sloped so not good for sleeping on. It was a big fail. Lars took her on the sofa for a few hours so I could sleep some and I think Niamh actually slept the most but it was not a fun night. Oh well, 1 more molar down. In other blog news I have been building a milestone tab for Niamh milestones, and, I’m on book 8 of 100 on my book challenge page. A bit behind on both but that is the way life goes. Thats all for now, time to watch the Olympics some and go to sleeeeeep. It was nice to have another weekend with next to no plans or expectations. I had a few things I wanted to get done but nothing major and we ended up going out shopping as our ‘outing’ of the day for Saturday. I had hoped to shop all by myself, then things shook out that Lars needed to be out so I thought bringing Niamh would not be too bad, she does like shopping too, just limits my lingering time. Then Lars didn’t have to go anywhere in the end and came with me shopping and full circle Niamh fell asleep about 10m before we got to the complex and so Lars stayed in the car with her (snoozing himself) and I got to shop alone! The upside was we all went to lunch together to a new place that was good and it was a pretty fun day. They even had maternity clothes on sale at Kholes so I have 2 new pairs of casual pants and a bunch of tops. I only got one specific maternity top, juniors fits just as well and is way less expensive. For some reason the pregnant look is in for the juniors crowd and for the shirts that are not babydoll, they are super long – all the better for covering the bump in something simi fashionable. Niamh adopted one of the shirts and wore it as a dress all sunday but thats no big deal, it will wash and hopefully she will forget her attraction to it. Valentines day was mellow. Lars and Niamh baked cookies that were very tasty. Niamh was under the weather a bit all weekend (teething? I see a new half molar) and wanted to cuddle and watch tv. We watched some olympics and the dog show as well as a bit too much Dora and random other dog shows. It is nice when she is extra cuddly. Fortunately she seems fine today so I’m fairly sure on the teeth thing. She went to bed and Lars and I had a nice evening with takeout sushi and candle light and more olympics. No other details necessary as my parents read but it was a nice evening. This week is another marathon – class, supplier visit in town, dr apt, two major meetings, supplier visit out of town (all day friday) and conf calls at all hours of the day and night since nothing magically fixed itself over the weekend. In fact, this week is Chinese new year so the Asians are even less easy to get ahold of. I keep telling people it is like Christmas… you just don’t call people on christmas! Oh well, I called them today (tonight) and hopefully it works out. I can’t believe Feb is more then half over, March has some travel in it too but fun travel – need to get to booking those tickets and getting a dress. So that was the weekend and a pre-excuse for me not writing alot this week. Hope people enjoy the pictures on flickr, I have some more with Niamh’s favorite toy of the moment – a really big snake – no one can accuse us of gender biased toys. Wow, the sky just fell on Monday…. All was well and then it wasn’t. When this happens the only real solution (according to my company) is constant conference calls. unfortunately the two suppliers off track are Asian so that means calls at night with them and calls all day with other people in the company where I constantly have to explain that no, I can’t get more info immediately, they are SLEEPING. Very annoying. On top of that my boss D is stressed because my two issues are not the only two issues but I didn’t do something fast enough for his liking so he asked me if I’m overburdened. Insulting! I am tired but on top of it and he didn’t even ask what was going on before assuming. Oh well, I’m just a delicate flower I suppose. So with calls at 4:30 and 9pm and a bit of Niamh time in the middle there is not much room for anything else. We did make valentines, Niamh painted and I assembled and did the writing. She did narrate some messages for a few of the cards. They ended up pretty nice. The ones I took pictures of were for her class. Most of the class did the prefab ones but Niamh had a good time today looking at all the cards and she liked me telling her who they are from. 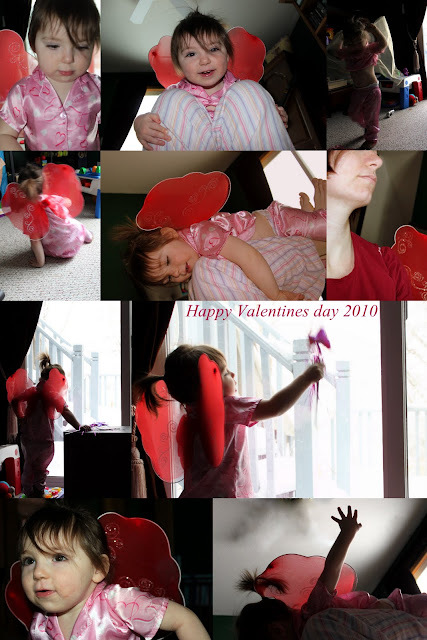 I’ll take pictures of her in cute heard pj’s for a Valentines day collage too, if she is in a picture mood, but she does love the camera. The baby in the basket pictures I just posted were from Sunday when we get ready for a bath part of her ‘job’ is to put her clothes in the laundry basket (this also gives the tub time to fill) and she takes the job very seriously. Sunday we were actually taking a shower together so she saw my clothes on the floor and had to bring them in to the laundry too and then she didn’t come back…. I peek in her room and she is sitting happy as can be in the mostly empty laundry basket and its so cute I have to take pictures. I’m glad nobody took a picture of me taking her picture since those were my clothes she took I was not wearing too much. One can’t pass up a photo op though and the camera was pretty handy. Ironically, she liked either the attention or diversion and did the same thing the next bath night complete with telling me ‘camera? !’ but no pictures of that one since it would have been the same and we were short on time. Update on the big kid bed; the transition now seems complete, she ignores the crib all together. New wrinkle, she figured out door knobs… time to baby proof the knob because I don’t like waking up an hour early to her little face in mine. I’m glad her first choice of places to escape to is our room and its nice to cuddle but she really never sleeps. She says she will and will play possum for about 30 seconds before she is back to wiggles and squirm. I would love to get a picture of us all sleeping in bed but I don’t know how that would be possible without a 3rd adult in the room and that might be not so good early in the morning. Maybe when I get a tripod… ok, well this was just a note to say I am still alive, work just tried to eat me. The cleaning was sped along because we had a little play date on Sunday. This is roughly 1 year from the first one with her ‘bf’ from daycare I didn’t get many pictures but the kids actually played together not just near each other. We intended on sledding and we did some but the fresh powder really does nothing good for sledding. I did get a decent workout going up and down the hill and maybe next week will be better. The guys at work suggested I take the hose to it but I’m not sure the kids need that much speed! I know the kids see eachother every day but its fun to see them together. Niamh keeps referring to ‘J-me’ stuff around the house, the booster he sat in, toys they played with etc. Otherwise the weekend was nice and dull. No drama, no travel, not even a trip to the store. Niamh was a very good helper with the laundry and since the biggest lesson in child raising is ‘go with it’ I ended up cleaning my bedroom because that is where she decided she wanted to solo play for half an hour. No reason to drag her to the room I had intended on cleaning since our bedroom needed it too. Tonight we could play with puzzles and do dinner and bath and bed with no angst about cleaning and I’m now free to write this, and, exercise. oh, before I forget, big kid bed is doing well. She stays in it and everything. We had a few days back in the crib at her request but then back to the toddler bed. I learned tucking her in tight helps, and, I let her take one of my pillows so she would have good dreams and last two nights no nightmares. Ok, time to slowly run a mile.